Our team provides testing services to other teams in the company, in their contexts. That means we cover a selection of products, domains, and technologies across several development groups, operations, professional services projects, our internal compliance process, and more. In terms of methodology, we are in permanent Scrum teams, we join time-bounded projects set up to implement a particular feature or satisfy a particular customer need, and we work day-to-day with groups whose priorities and resources are subject to change at very short notice. In spite of the varied nature of our assignments it's historically been our desire to maintain strong team bonds and an information-sharing culture and so we've engineered some formal and informal opportunities to do that. Amongst other things, each week we have a catch-up with some kind of presentation (such as a feature, a tool, an approach), we have a daily stand up (roughly: prefer outcomes over outputs, share issues, ask for data or help), and we have a tradition of optional, opportunistic, 5-10 minute overviews on topics that are potentially interesting right now but too deep for stand up. We also have a regular team retrospective in which we allow ourselves to discuss pretty much anything about the way we work. It tends to stay out of project specifics — because they'll be discussed within the projects — but recent topics have included dedicating time to shortening the run time of a particular test suite to enable developers to get faster feedback from it, creating a specific type of virtual machine for us to share, and reviewing how we schedule work. At the start of 2018, a retro topic that I proposed after hearing Keith Klain speak at Quality Jam 2017 was voted up. In his talk, Keith said that one of things he likes to see in a team is a shared understanding of the important factors that frame how they work. Based on that, I asked should we establish a set of team values, principles, or a mission statement? What do we want to create: a defined mission? principles? values? ... and how do these things relate to one another? It shouldn't be be too low-level; it should apply across teams, projects, and so on. It shouldn't be restrictive or prescriptive; there should be flexibility. It should be a framework for decision-making, not a decision-maker. 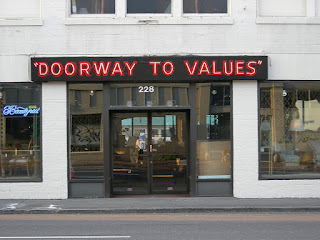 Do we really need anything different to the company values? Do we want it to change the way we work, or encapsulate the way we work? Do we want others in the company to see it? ... and might it change how others see us? Some of these were published after we started so didn't have as much chance to influence what we did. Iain McCowatt's Principles Not Rules was inspiring to me, but is unavailable as I write this. It's such strong material that I've left the links in the list above in the hope that it'll come back. Small comfort: I saw his talk on the same topic at EuroSTAR 2015 and a handful of my notes are here. Closer to home, we observed that our company has some useful data to contribute: our corporate values published on the internal wiki, and a set of informal values that are regularly called out verbally at all-hands meetings. We strive to provide relevant information to stakeholders and we're flexible about how we do it. We use and we eagerly solicit peer review, we’re open to new ideas, and we perform regular retrospectives to help us improve ourselves and our work. Our company respects what we do, and we’re a core part of our company’s work and culture. Linguamatics is active in the local testing community, regularly hosting meetups and Lean Coffee. We have regular in-house training in testing and other skills. ... look for ways to improve yourself, your work, the team and the company. We wondered if we should think about making our implicit shared values explicit. We discussed it, and decided that we'd give it a go. We did some research to see what was out there, and what we already had. In the next few posts I'll describe how we moved from this point to a set of values that we can agree on as a team.